I completely believe in epiphanies. I love them. I even love the word – epiphany. Just sounds elegant, magical, powerful…and they are. But, living in the aftershocks of an epiphany can be hard work. 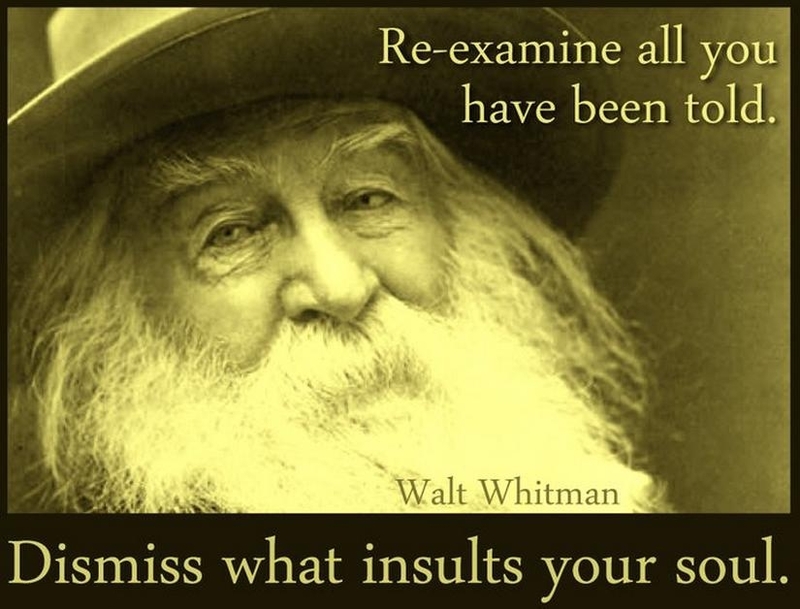 So, we tend to miss them…dismiss them….talk ourself out of them…even avoid them. Maybe that’s because they’re so damn hard to prove and we believe we should immediately be forever changed…..and forever change, well, takes forever. Maybe because the best epiphanies are so private and so dear and so invisible. They pierce our souls and our souls pose tricky landscapes for tracking any sure footings. We pretty much ignore, dismiss, disrepect, deny our poor souls. But I need a power surge; a trumpet call. One word to plaster across every nook and corner of my world. One word that will take my hand or shove me through my soul’s door to the epiphanies that have been piling up for too many new year’s gone by. One word that will serve as a sign post for my comings and goings in 2013 – planned and unplanned, welcomed and unwelcomed, internal and external. Hmmm…..maybe my one word should be freedom. See, personal freedom scares the hell out of me. Though I talk a good game about freedom, I crave control and worship order so I prefer to live by clear rules and regulations giving me the illusion of having massive control. Spontaneous I am not. So real, true blue freedom is one of the greatest challenges in my life. It is a value I either took for granted or suffocated to death. When I use the word, freedom, I don’t necessarily mean freedom as in our American freedoms though goodness knows my even indulging in personal freedom is a direct result of living in a free country. So, from the outset, choosing to live with increasing awareness of personal freedom begins with profound humility and gratitude for those who made such a quest even possible. The truth is I didn’t so much choose this word as it chose me. Once I made the move from the town where I had lived for over 25 years this word smacked me in the face at the first Tennessee state line. When I moved, I spent alot of time reflecting on the numerous areas of my life that had determined my identity and so my decisions. And I realized with stunning conviction that I had never, ever questioned whether I even agreed with the beliefs and conclusions that drove those decisions. And those beliefs, regardless of their accuracy, conspired together to create my life. Once I was physically removed from so many of those influences and obligations, I looked deep down underneath those beliefs and conclusions – and you know what? I could not find me. I could not find me. Oh, I saw lots of other folks and circumstances and events. But, my small self was noticeably missing. So, whose life was I living and why? I had believed a huge, giant, devastating lie. I believed I was born to be someone other than me. I believed I was not free to be myself but destined to be someone else….someone better. Spent crazy years playing hide and seek. Came pretty near being forever lost in that game. Can’t blame anyone else but me for playing that backyard game far too long. At this late date….playing hide and seek has lost its sparkle. But, how to step out from behind the big oak tree? Tell the Truth. Just tell the truth. Tell the truth without judgment because this dangerous freedom is best lived with love. And where in this world of hide and seek does one begin to find one’s self? Soul – That marvelous mystery of gut, heart, will, intellect, spirit and all that makes life worth the fuss and bother. Soul is the beat of every song ever loved, every dance ever danced, every kiss ever cherished, every prayer ever prayed. And I - and maybe you – have badly dishonored, dismissed, and disrespected my soul. Oh, and for the love of your own soul, please do not reduce your soul to your belief or lack of belief in God. Beliefs are your beliefs. Beliefs are not your soul. Beliefs may certainly be nurtured by your soul though it is more likely that your soul has been starved by your beliefs. Oh, you know what? You know what? As I am writing these words so early this morning that even the sun is still sleeping, tears are streaming down my face because I am just so damn grateful that my poor little underfed soul didn’t up and die on me. After years of pounding it and squeezing it and choking it in an endeavor to force it into boxes and closets and pews and offices and houses and god knows where else that it never, ever belonged …it still hung on for dear life. Sweet soul of mine…..forgive me. One small first step into freedom of soul is to love on, indulge in, take care of, show respect to my soul’s mystery. And I am the only person in the universe who gets to do this great work for me. No one else can do it. Just me. And I am free to listen, to be surprised, to wrestle, to rest, to absolutely honor this inner compass, this inner light, this soul of mine. Because if I neglect to know my own soul then I will not live my own life. So, the best place to begin a new year, a one word quest is right where you and I are. Now you may have to go find yours….your soul, I mean. And when you bump up against yours….that bump might feel a little unnerving, even intrusive, definitely unfamiliar. Keep going. Especially once you peel away any artificial layers you have plastered over it. Keep going. And what do you do once you bump into your grand old soul…. Lose all that is not truly and magnificently you…. And, oh yea, one true blue trusted companion comes in really handy…. Crazy, over the top, wild, winsome don’t give a hoot what you think love…. Thanks to all of you who responded to my first shakey step back into writing and connecting to an online community. Your kind words were like a long, cool drink of the purest water. To be honest, returning to writing feels more about me than about you. I hope saying that doesn’t sound incredibly selfish because actually writing for others to read is increadibly terrifying. But, it’s the strangest thing….I can’t seem not to do it. And here’s a few reasons why….The first one is about you. I have a huge hope that you will be encouraged, challenged, even unsettled from time to time. Truth is this simple practice is necessary for me right now. Like all disciplines, the sweetest fruit will take time to show itself but already I know these things to be true…. #1 – writing provides a daily discipline that I very much crave and need…. So, thank you for being a part of a team that I need and treasure…. Along with writing regularly and posting one of my goals is to relaunch my coaching practice and website so as to empasize the blog rather than the coaching. This shift is huge for me because I am very computer challenged and a big fat scaredy cat when it comes to technology and transparency. But I believe it is more powerful and far more interesting to focus on stories – yours and mine – and allow partnerships to emerge as a result. As changes occur, I will let you know because your feedback is crucial. For now, any input from you or sharing with your friends about the blog is much appreciated. Oh, how you’ve been missed! Oh, how you’ve been missed! Oh, how I hope you find yourself welcoming this shiny new year with open arms and an even more open heart! So, the thing is…..I have been on an extended sabbatical of sorts…moving from North Carolina to Tennessee and using that move as a kind of cover up for foolishly vowing to never again write or coach or tell stories. Just as I packed away boxes of memories to squeeze this move into a respectable space, I packed away my love for writing, coaching, telling stories, and even for all of you. I believed that old wounds justified wrong judgments. They do not. They absolutely do not. Yet, in the darkest corner of the attic, I hid my boxes, bound and burdened by weathered tape, never to be opened again. But, those loves – as all true loves – would not be denied. So, on this blustery second day of this brand new year, these loves have relentlessly hounded me until I must release them to the wild and open way of 2013. And in doing so, I have discovered how deeply I have missed all of you and myself. One is marked by judgment and condemnation and fear and offers no power, no love, no hope. The other flagrantly flaunts love, power, joy , forgiveness, and precious freedom even in the midst of mess and miracles. The first road is so very crowded because many choose it only to become stuck smack in the middle; wondering why there are no new sights or vistas or risks. The second road is filled with new sights, vistas, and risks. But, it is oh, so gorgeous and exhilarating and true. We’ve been absent so long from one another that I have no idea which road you find yourself traveling this new year. Doesn’t matter…the truth is you are never, ever stuck. But, you may need to recalibrate. You may need a paradigm shift. You may need power. The truth is you have always had such power within you. You only need to tap into your joy reserves – which are directly opposed to your critical voices. Wherever and whenver you have experienced true, honest, intrinsic joy that is your pathway out of the crowded, suffocating road and onto your own road less traveled. But….you might need to intentionally seek such joy…remember it…identify it….savor it…..and then pursue it with everything you’ve got. And if you need a word of hope, a story to lift you up….let me know….once I emptied those dusty old boxes, I found I have more than enough to share.